Although Internet via fiber optics have been available in our neighbourhood since a few years I have not felt compelled to opt in but have instead retained my ADSL connection despite its moderate 6-7 Mbps download rates. There have been a number of reasons. I really never felt the need since what I was doing never really required a lot of bandwidth. The regional council that manages the fiber network have some funny ideas about how to run things which have caused the major operators to opt out so I would have to switch some a small local operator instead. I was also hesitant about the installation itself which would require cabling from the main trunk in the street into our house. We have some friends that opted in rather early and they ended up with water in their basement and a damage incoming phone wire. Anyway, things change, the operators seems to have matured and the bad ones are gone. I have several friends that have opted for fiber and could give advice on which operators that where good and perhaps most importantly, my oldest son are now a teenager and bogs down my ADSL line every time he opens his computer. So a while ago I opted in for a fiber connection with a speed of 100 Mbps symmetrical both ways. I actually get pretty much what I was promised as well. My tests show around 95 Mbps of actual throughput. The speed difference between the fiber and the old ADSL is of course significant. One thing that is really nice is that when I work from home, via remote PC, it almost feels like being at the office in terms of response times. When switching to fiber I also decided to get myself a new router. Even though I could theoretically use my old DGND4000 as a router only I was never really happy with that one. It was just buggy. 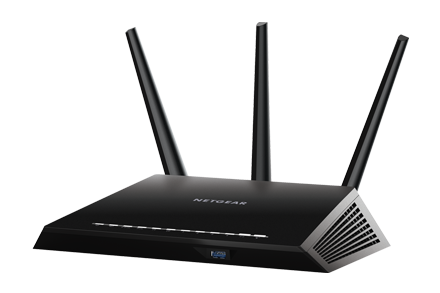 I was actually hesitant whether or not I should by another Netgear product but I had been happy with them before after all so I decided, based on several reviews, to give them one more chance and go for their R7000 Nighthawk model. I was especially interested in the WiFi performance. It is a dual band IEEE 802.11 n and ac router with 3 adjustable antennas, beamforming etc. etc. Basically all imaginable home-router features including a kitchen sink. The theoretical throughput is 600 Mbps for the 2.4 GHz band and 1 300 Mbps for the 5 GHz band. There is of course little chance that you ever get close to those figures with your everyday mobile devices and it would be a huge overkill anyway but it is a bit like buying a car. If you want good acceleration then you usually get a higher top speed than you can actually use as well. What I wanted was enough range to cover the entire house which would also mean that the signal had to punch trough a couple of concrete walls. Three separate and adjustable antennas and automatic beamforming sounded just right for me. A dual core processor and a rather complete feature set was just an additional plus. Installation was really a breeze. I connected it with the WAN side to the fiber box and the LAN side to my PowerLine network and powered it up. As soon as it was up and running I could open the web interface from one of my desktop PC’s and make the final settings. There was really not much to change from the defaults. The password of course, the names and keys of the WiFi networks, a few static IP assignments that I wanted and that is it. I have not really had it operation for more than a few days but so far it is performing as expected. Especially the WiFi with a fast and stable connection no matter where I am in the house with any of my mobile devices. And it looks cool as well, at least for a computer geek. The choise of name, Nighthawk, is rather fitting.